While living in St. Helens, a friend brought a group of us together to try a new game he had discovered. 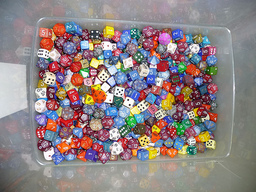 It came in two boxes, one red, and one blue and was called Dungeons and Dragons. The majority of us were sold on the game after just a couple of gaming sessions. We quickly moved on to AD&D, playing almost weekly in one or another of our gaming worlds. With 4 or 5 of us alternating being DM and players, it seemed there was never a lack of adventuring within the group. We took on 2E AD&D when it was released, still gaming almost every Friday or Saturday night, sometimes both. I Dm’ed a lot during this time as I had the most fleshed out world and storyline of the group, but others still took their turns behind the DM screen when I needed time to finish up a particular adventure. After making the move to the Portland area, gaming kind of took a backseat to career most of the time. We made several attempts to get a group together, but it usually lasted no more than 2 or 3 sessions. When 3E came out, I started to get back into the gaming world, playing one of my most interesting and memorable characters-Thoriss, a lizard man fighter. Eventually, that group died out, and so did my chance at gaming. Now, after quite some time, I am looking to get back into the hobby. The last version of D&D I played was 3E (before 3.5 was even a thought), so I am a bit behind the times in some aspects. I do have the three core 3.5 books available to me on my PC, as well as a lot of the Pathfinder info, but I am just starting to get my feet wet in these versions. The availability of FtF gaming in my location is pretty minimal, so I am looking at getting into doing some online gaming very soon. I was going to start a play-by-post adventure using the 2E rules, but I think there is more interest currently with the 3.5 and Pathfinder rules, so I am looking at updating my adventure to fit one of these rules sets.